Show in ToC - Determines if the article will appear in the Table of Contents (ToC). By default the article will appear in the Toc. 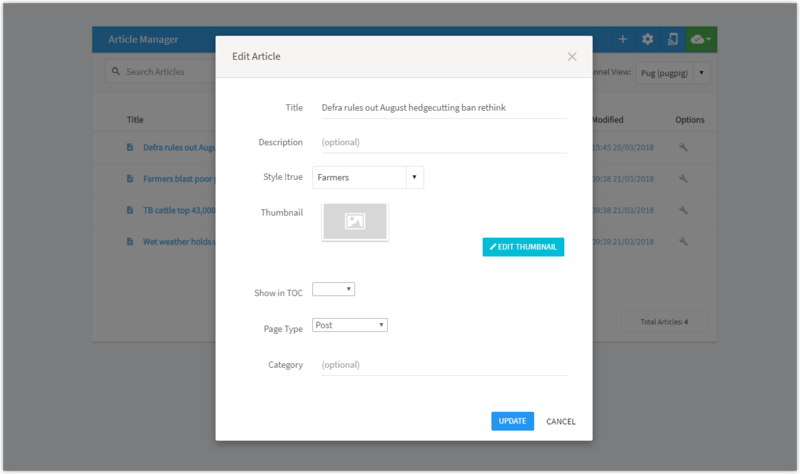 Page Type - This is optional and is used to help identify the article in analytics. The default page type is ‘post’. Category - Specifies the category name to use for sectioning the ToC. If not specified, the standard section category will be used. Hide article – This enables an article to exist but to appear hidden in both the staging or production apps. If an article is hidden, you can make the article visible again by clicking the eye icon. Duplicate the article in the current issue. Duplicate the article and move it to a different issue. This is useful if the same article content is required to be used over several publish cycles.